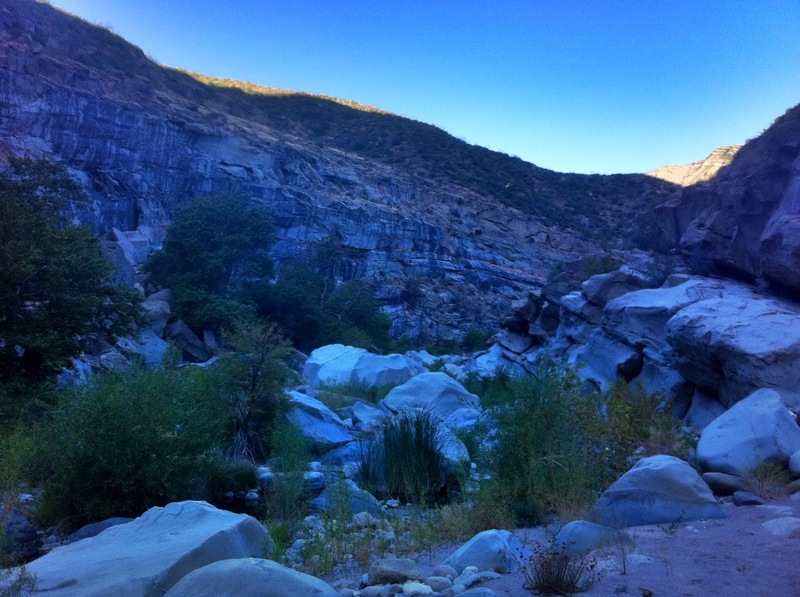 I plod along the dirt footpath of Sespe Creek Wilderness Trail in the chill of early morning leaving the Piedra Blanca Trailhead behind. It’s 4 am and I’ve been up for two hours. Falling into a steady pace along the wide open flats, I march by rote in a sleep deprived trance. My vision narrowed to a tight focus with eyes fixed to the spot of continuously passing ground illuminated in the faint glow of my headlamp. The trail materializes out of the blackness and passes underfoot in a mottled pattern of dewy wet and dry patches. Breath vents from my nose in plumes that obstruct my view in a constant fog of condensation. Glancing skyward the beam projecting from my forehead disappears into the darkened starsprent void. Ahead of me David Stillman‘s spotlight bounces along in the blackness of night as we march in silence toward the slimmest sliver of a crescent moon hanging low on the horizon. Venus rises sparkling brilliantly like an orange-tinged diamond. The planet ascends over the black mountain line silhouetted before us against the faint, warm glow cast by the sprawling metropolis of Los Angeles County. 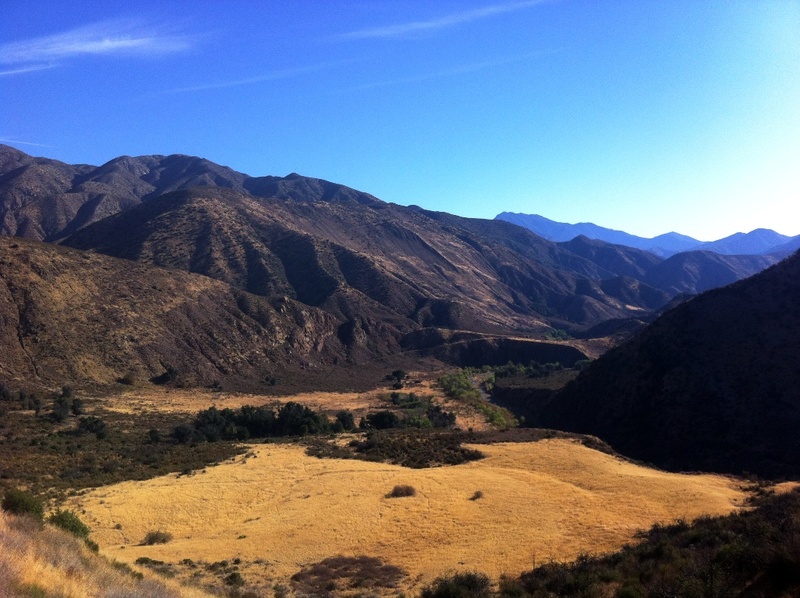 For three hours we march in the predawn darkness fueled by eager anticipation, as we head toward the pièce de résistance of Project Sespe Creek; the bouldery and trailless gauntlet running through the Sespe Condor Sanctuary. Our camp for the night, Stillman sitting on the right. We set out from Piedra Blanca at 4 am on Saturday and ended at 5 pm Sunday on Goodenough Road north of the town of Fillmore. 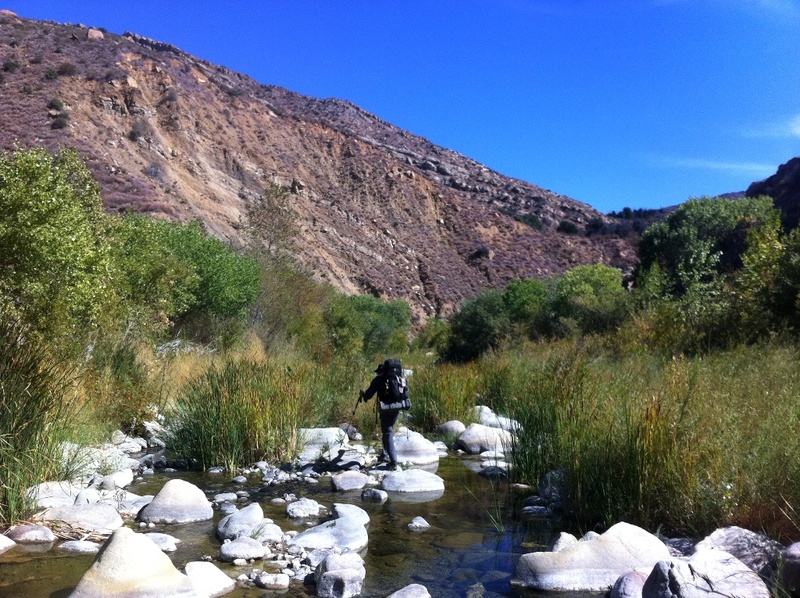 The first 13 miles we followed the Sespe Trail and then dropped into the creek downstream from Coltrell Flat, hiking the remainder of the distance off trail. In total we walked upwards of 30 miles after zigzagging our way down the boulder-strewn canyon bouncing like pinballs from boulder to boulder. Having covered about 16 miles the first day, we spent a warm, clear night several miles downstream from Coltrell Flat on a patch of sandy gravel beside a pool. We arrived just in time for a swim before the sun sunk below the ridgeline. A rock slide jarred us awake in the middle of the night. From a sound sleep my eyes popped open to focus on the blackened ridgeline high above silhouetted against the gleaming starry sky. I wondered if the few trees behind me and massive pile of driftwood would do much to stop large tumbling chunks of jagged stone. Fortunately, the slide wasn’t too close. Twelve hours later, after having walked up on them in the creek, a group of deer including a decent sized buck kicked loose a sizable boulder while climbing up the mountain, which came rolling down the slope and into the creek bed. 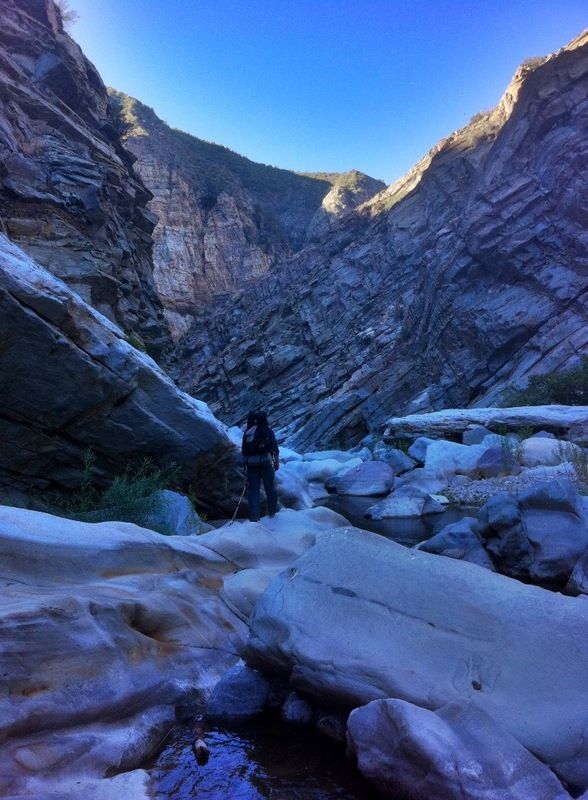 We headed deeper into the canyon and the creek bed became significantly more rugged with progressively larger boulders, looming rock cliffs on either side and a considerable decline in the slope of the watershed. At one point I felt as if I was getting funneled down into a bottle neck, as the canyon narrowed between rocky walls. One particular section of solid bedrock lining the canyon in a sheer cliff appeared, on a smaller scale, reminiscent of the rimrock formations found in the American southwest. 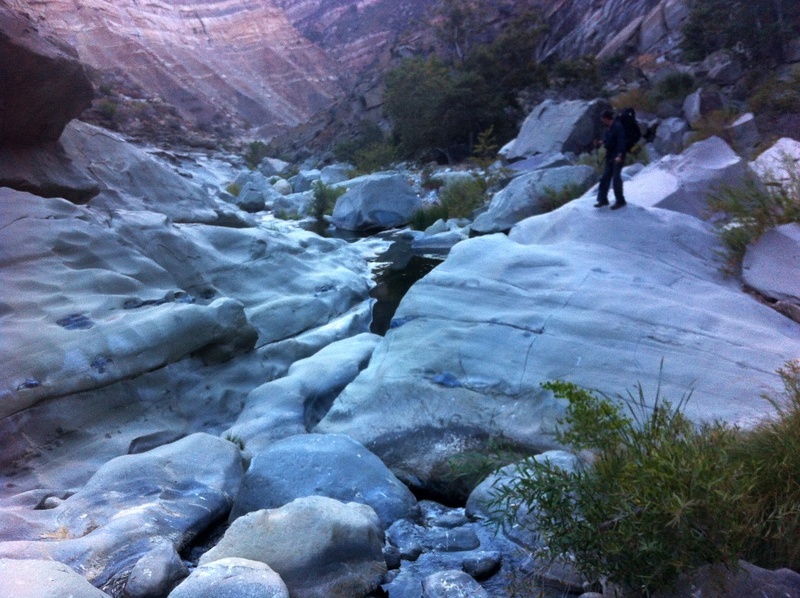 The serene feel of the canyon was belied by the rough landscape. It sits in silent testimony to the immeasurably violent force that rips through the drainage during winter storms and has carved the canyon from the scalp of the earth. The polished wear and stain left by debris laden water on rock surfaces high up along the side of the canyon, and the huge jumbles of driftwood piled in among the trees on the creek banks, and the snags caught high overhead in tree branches, tell the tale of surprisingly high water levels during winter flood conditions. 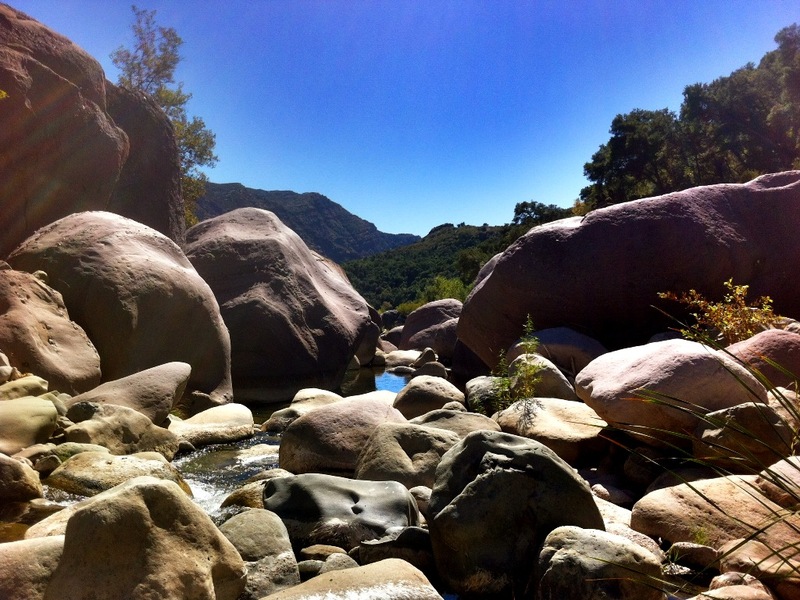 The roar of chocolate-colored water flushing boulders and logs downstream, scouring the canyon ever deeper, must be an incredible sight if it’s not able to be felt resonating through the earth during the height of storm runoff. 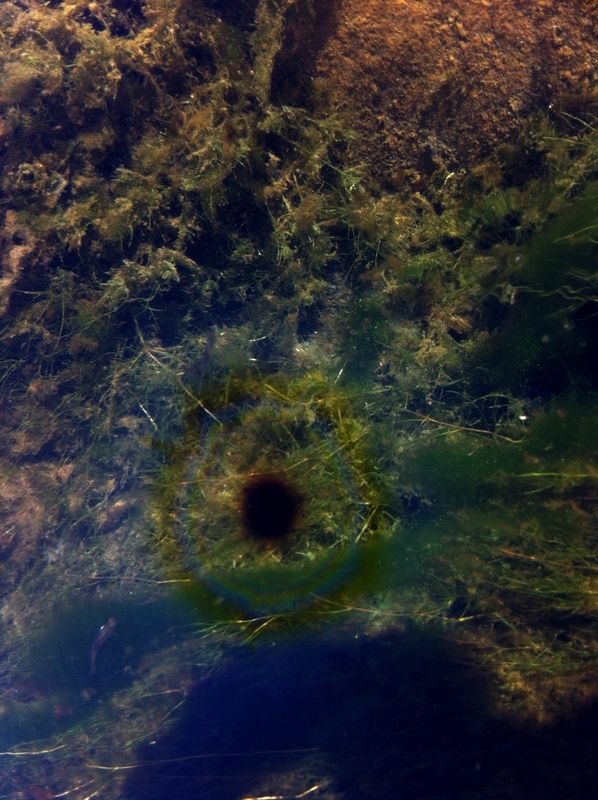 The redolence of oil wafted through the windy canyon in areas where natural seeps drip from the cliffs and ooze from the ground and its rainbow sheen could be seen floating on the surface of the stream, while scores of minnows darted about in the cool mountain water. On one occasion I passed by a fresh gooey black pool of oil right in the middle of the creek, a tar pit several feet in diameter and more than a foot deep. 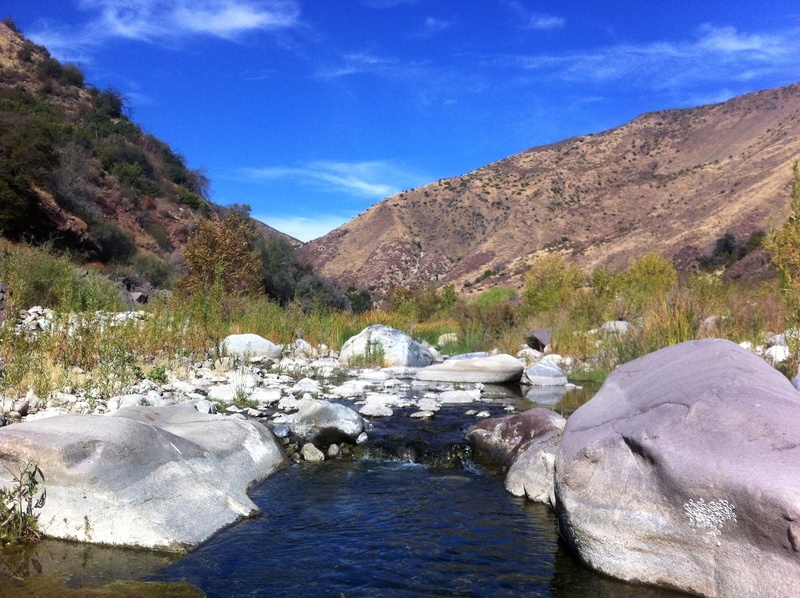 Amid all the oil, once upon a time, thousands of lengthy southern steelhead once flourished in this stream, which represents one of the most prolific trout habitats in Southern California despite naturally occurring petroleum flows. 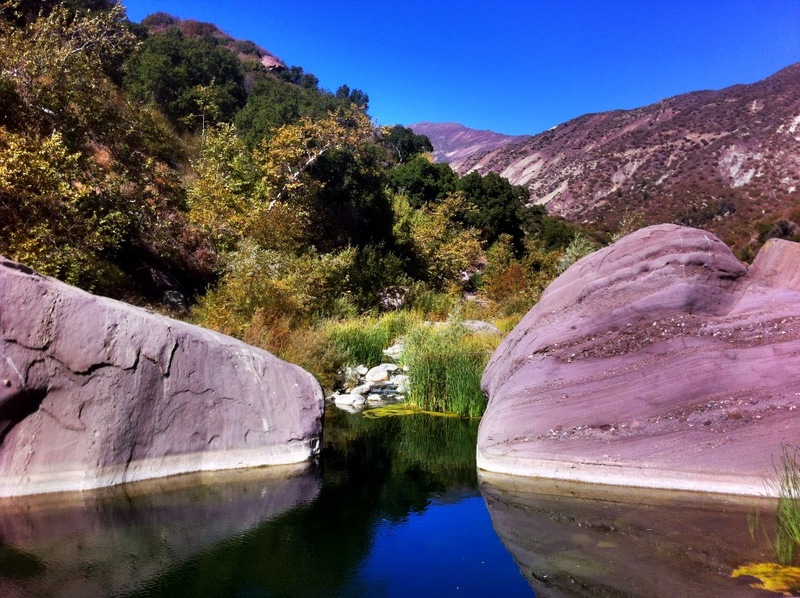 Downstream from the Tar Creek confluence the Sespe is jumbled with massive purple boulders and is more rugged and harder to traverse than it tends to be upstream. Approaching some piles of menacing looking rocks, some of which were the size of small houses, I wondered if they were passable without climbing gear. They were. We passed through the gauntlet with much effort, but without need of the ropes and harnesses Stillman had prepared. 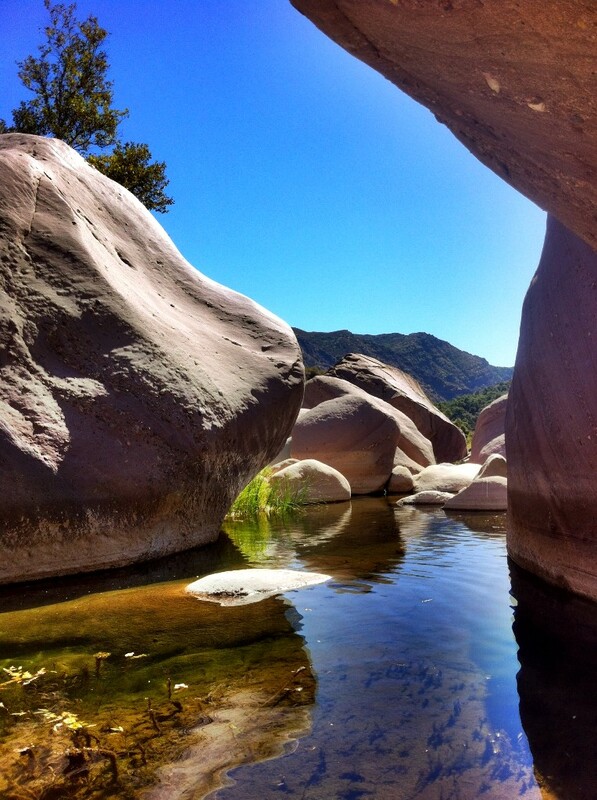 It was about 16 miles of boulder hopping until we stomped our way out onto the rocky flats downstream of the exposed bedrock narrows called “Devils’ Gate,” which frames the Sespe on it’s lower end just before it drains out of the mountains and heads toward Fillmore. We had made it unscathed without even so much as a blister on a little toe. Stillman plotting his course through the jumble. Looking upstream over the section shown in the previous photo. I noticed this remnant of a stacked stone wall high up along the steep mountainside above the creek. Any locs out there have any idea what it’s from? It was somewhere below Topatopa and Devil’s Heart Peak. Looking downstream toward what is labeled “Grassy Flat” on several maps, the Bear Heaven cliffs seen in the distance. I saw nothing around here that was flat or grassy, which left me wondering what the value of a map is that’s made by a guy who apparently takes old USGS information and runs it through his Macintosh rather than reconnoitering the land himself. Or am I way off base? Did I miss the flat that’s grassy? What say you Harrison? 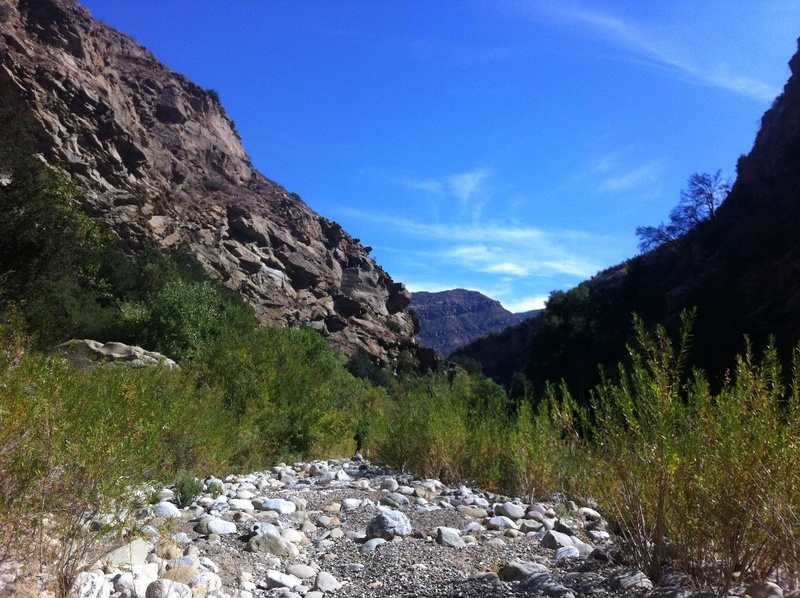 The confluence of West Fork Sespe Creek with Sespe Creek proper. The West Fork flows in beside the purple boulder on the left. 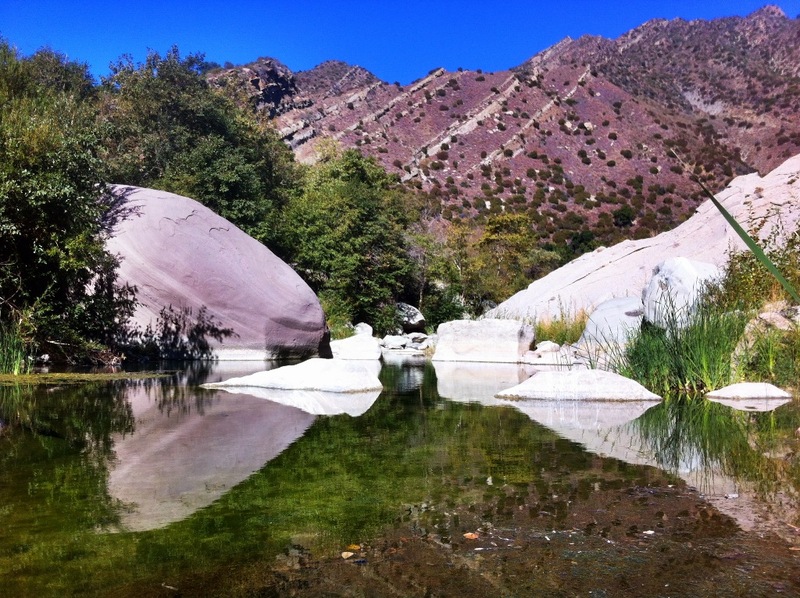 This entry was posted in Ventura County and tagged backcountry, Backpacking, Hiking, Landscapes, Nature, Outdoors, Photos, Pics, Sespe, Wilderness. Bookmark the permalink. That’s my favorite part of the Los Padres. I’m glad you got to finally check it out. It’s funny, when I was out there a few years ago some folks reported a huge rock fall in the same place you camped, spooky. I’m guessing that those stacked rocks are left over from when there was research going on for a dam being built. They cut some roads and took core samples back there in the 60’s or early 70’s. Thank goodness it never happened. Hey Eric. 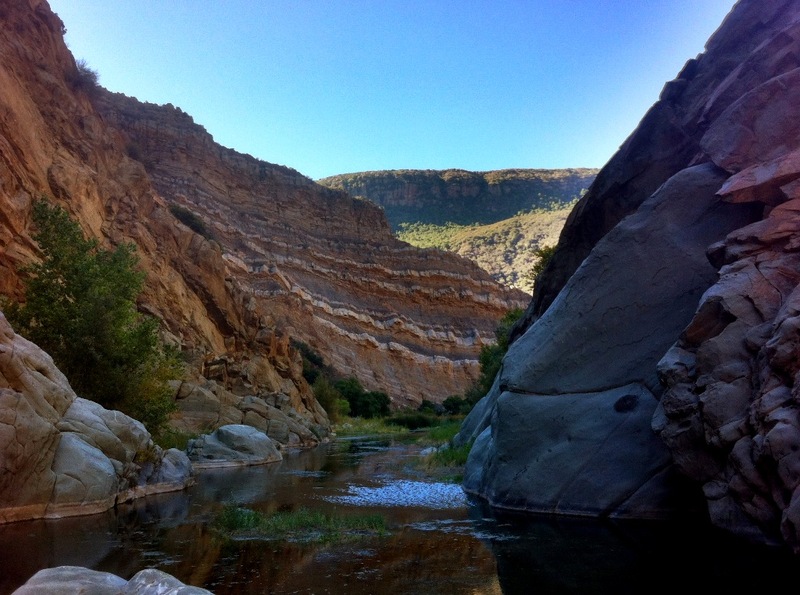 Purportedly there still exists a right-to-build option for a dam somewhere around Chorro Grande, as a result of the agreement to bestow the official “Wild and Scenic” status to the rest of the river. 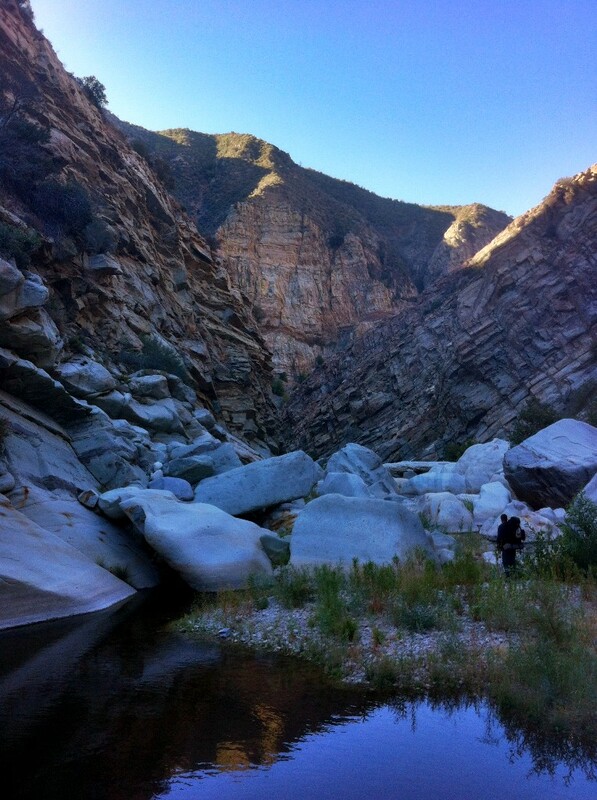 I don’t recall exactly where, but upstream in that general upper Sespe area give or take. It’s hard to imagine a dam being built in this day and age, but nonetheless. Excellent TR bro. A pleasure doing business with you. Very well done; very well told. 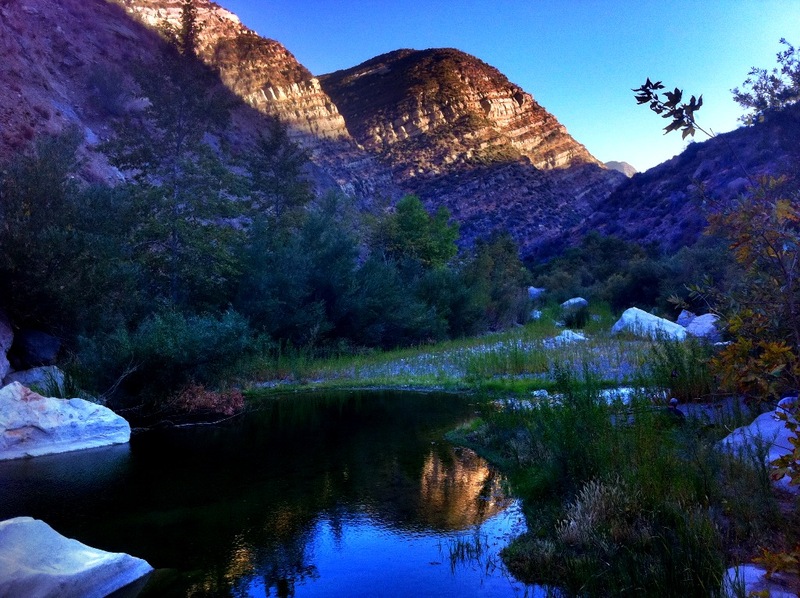 Did you have the opportunity to look for any sign of the West Fork Sespe camp? My guess is if not completely obliterated it is most likely completely obscured by willow. Whatever the condition of the site I do take solace in the knowledge that it is not on the bottom of a reservoir. No, unfortunately, we didn’t look around. By the time we reached that stretch of the creek we didn’t have much energy to spare for it. 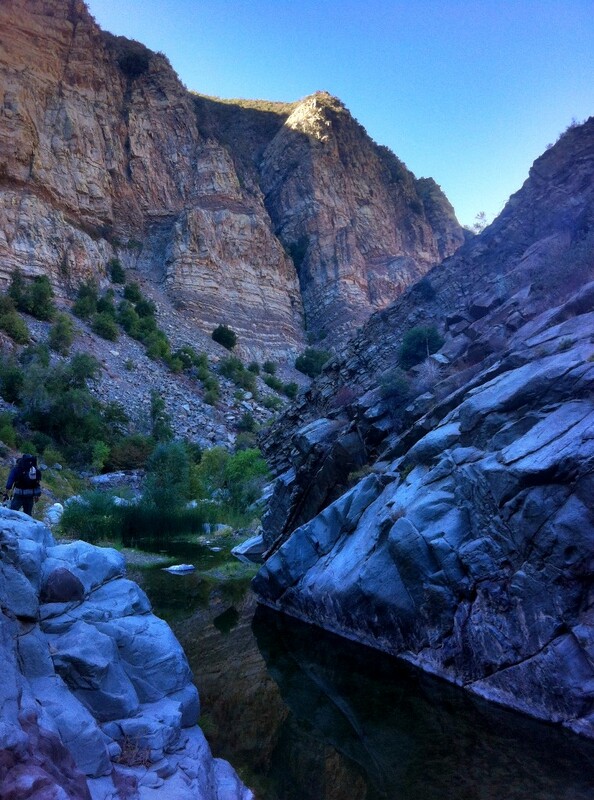 We’d been hiking all day and still had some distance to cover to get out of the canyon. We did your route in mid-June one year from Lion’s Camp, and later again from Dough Flat, both as 3-day trips, but exiting via the Tar Creek trail. Very warm! But the swim section in the middle section, first thing in the morning, was really chillyl! We had time to explore up W. Fork, which was lovely and it seemed like one could go quite far without much difficulty and maybe even go up to the Last Chance area. 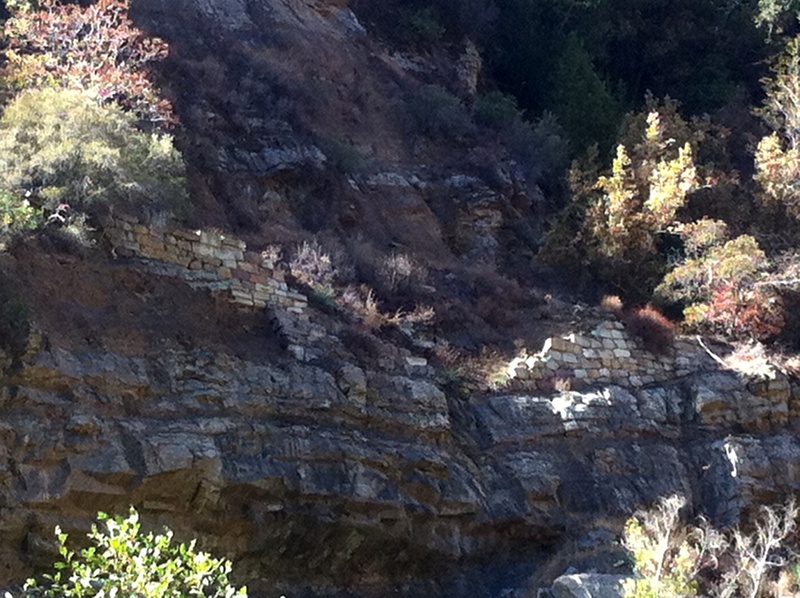 That rock wall is from an old oil-exploration road from the 30’s, we heard, that came down from Tar Creek. Signs of the road are still there up on the flattish area up above the creek to the west, if you cross the creek and go up after the trail down meets the creek. We camped on fine gravel near “Grassy Flat” and watched a bear climb up cliffs across from us. Hey George. Thanks for stopping by, and for the info on that rock wall. Interesting to hear you comment about West Fork, as I’ve been wanting to get up there for a looksee for awhile now.